Sicario: Day of the Soldado joins Deadpool 2 and Incredibles 2 as summer 2018 sequels that, despite not being on quite the same levels as their predecessors, provide reasons to make trips to theaters. 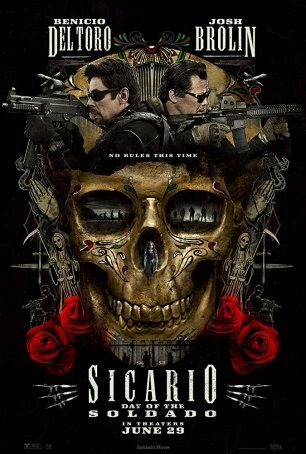 Although not a direct continuation of the 2015 film, Sicario, this second installment focuses on CIA operative Matt Graver (Josh Brolin) and his “asset,” hitman Alejandro (Benicio Del Toro), who remains a cool customer even in the direst of circumstances. Although these two were secondary to Emily Blunt in the original, they move to the fore this time around. Taylor Sheridan has returned to write the screenplay but many of the other behind-the-scenes players have changed. Denis Villeneuve, unavailable due to commitments to Blade Runner 2, has been replaced by Italian director Stefano Sollima. Cinematography duties have been assumed by Dariusz Wolski (replacing Roger Deakins, who won his only Oscar working for Villeneuve on Blade Runner 2) and the music has been composed by Hildur Guonadottir (replacing Johann Johannsson). Despite these alterations, Day of the Soldado retains the edge-of-the-seat and nihilistic qualities of its predecessor, but there are shifts to the overall tone, which is neither as stark nor as ominous. This is Josh Brolin’s third film of the summer and, although it will accrue considerably less at the box office than either Avengers: Infinity War or Deadpool 2, it’s his best showing as an actor. With no CGI safety net, Brolin has to rely on his charisma and talent. He recreates Graver with the same mix of no-nonsense, whatever-it-takes attitude he evinced in Sicario. Benicio Del Toro, meanwhile, displays the cold, unflappable façade of a hardened killer paired with the heart of a man who still bleeds for his lost family. Alejandro doesn’t have much backstory but the little we know is heartbreaking. In Day of the Soldado, he becomes the protector of a teenager, a cartel kingpin’s daughter named Isabel (Isabela Moner). Oddly, there are some similarities between Alejandro and Brolin’s character in Deadpool 2, Cable. And the overall Alejandro/Isabel story arc recalls the similar pairing of Hugh Jackman and Dafne Keen in Logan. The base storyline is convoluted. The Secretary of Defense, James Riley (Matthew Modine, playing yet another weasel), and his pet spymaster, Cynthia Foards (Catherine Keener), have decided that the best way to prevent domestic terrorism is to clamp down on the porous U.S./Mexico border, which is providing entrance to the terrorists. To that end, they decide that a war between the drug cartels, who control the tunnels into the southern U.S. states, would be advantageous. To facilitate that, they call back Graver from North Africa and he assembles a team that includes his old pal Alejandro. The plan is for them to kidnap the daughter of cartel prince Reyes (who has a connection to the murder of Alejandro’s family) and make it look like the work of rivals. Of course, things don’t proceed as expected since elements of the Mexican police force are being paid by the drug lords. There’s betrayal, disarray, and the sudden decision by the U.S. government to disavow everyone and everything involved in the operation. At times it feels a little Bourne-ish. Although Day of the Soldado isn’t as powerful as Sicario, it’s a worthy follow-up. The battle scenes are taut, there are instances of heightened tension (consider the sequence which one person has his head in a bag), and the character-related moments are effective without seeming too sentimental. Watching and appreciating the movie doesn’t require the viewer to have seen Sicario (although it helps provide background on Graver and Alejandro); Day of the Soldado stands on its own. The epilogue teases another chapter and screenwriter Taylor Sheridan has mentioned that this was envisioned as a trilogy. Considering how the various relationships evolve over the course of this movie, it would be fascinating to see where things go from here.